This article is about the stimulant drug. For other uses, see Caffeine (disambiguation). Caffeine is a central nervous system (CNS) stimulant of the methylxanthine class. It is the world's most widely consumed psychoactive drug. Unlike many other psychoactive substances, it is legal and unregulated in nearly all parts of the world. There are several known mechanisms of action to explain the effects of caffeine. The most prominent is that it reversibly blocks the action of adenosine on its receptor and consequently prevents the onset of drowsiness induced by adenosine. Caffeine also stimulates certain portions of the autonomic nervous system. 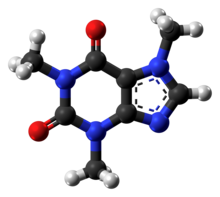 Caffeine is a bitter, white crystalline purine, a methylxanthine alkaloid, and is chemically related to the adenine and guanine bases of deoxyribonucleic acid (DNA) and ribonucleic acid (RNA). It is found in the seeds, nuts, or leaves of a number of plants native to Africa, East Asia and South America, and helps to protect them against predator insects and to prevent germination of nearby seeds. The most well-known source of caffeine is the coffee bean, a misnomer for the seed of Coffea plants. Beverages containing caffeine are ingested to relieve or prevent drowsiness and to improve performance. To make these drinks, caffeine is extracted by steeping the plant product in water, a process called infusion. Caffeine-containing drinks, such as coffee, tea, and cola, are very popular; as of 2014, 85% of American adults consumed some form of caffeine daily, consuming 164 mg on average. Caffeine can have both positive and negative health effects. It can treat and prevent the premature infant breathing disorders bronchopulmonary dysplasia of prematurity and apnea of prematurity. Caffeine citrate is on the WHO Model List of Essential Medicines. It may confer a modest protective effect against some diseases, including Parkinson's disease. Some people experience sleep disruption or anxiety if they consume caffeine, but others show little disturbance. Evidence of a risk during pregnancy is equivocal; some authorities recommend that pregnant women limit consumption to the equivalent of two cups of coffee per day or less. Caffeine can produce a mild form of drug dependence – associated with withdrawal symptoms such as sleepiness, headache, and irritability – when an individual stops using caffeine after repeated daily intake. Tolerance to the autonomic effects of increased blood pressure and heart rate, and increased urine output, develops with chronic use (i.e., these symptoms become less pronounced or do not occur following consistent use). Caffeine is classified by the US Food and Drug Administration as generally recognized as safe (GRAS). Toxic doses, over 10 grams per day for an adult, are much higher than the typical dose of under 500 milligrams per day. A cup of coffee contains 80–175 mg of caffeine, depending on what "bean" (seed) is used and how it is prepared (e.g., drip, percolation, or espresso). Thus it requires roughly 50–100 ordinary cups of coffee to reach the toxic dose. However, pure powdered caffeine, which is available as a dietary supplement, can be lethal in tablespoon-sized amounts. Bronchopulmonary dysplasia in premature infants for both prevention and treatment. It may improve weight gain during therapy and reduce the incidence of cerebral palsy as well as reduce language and cognitive delay. On the other hand, subtle long-term side effects are possible. Apnea of prematurity as a primary treatment, but not prevention. Some people use caffeine-containing beverages such as coffee or tea to try to treat their asthma. Evidence to support this practice, however, is poor. A It appears that caffeine improves airway function in people with asthma, increasing forced expiratory volume (FEV1) by 5% to 18%, with this effect lasting for up to four hours. Caffeine is a central nervous system stimulant that reduces fatigue and drowsiness. At normal doses, caffeine has variable effects on learning and memory, but it generally improves reaction time, wakefulness, concentration, and motor coordination. The amount of caffeine needed to produce these effects varies from person to person, depending on body size and degree of tolerance. The desired effects arise approximately one hour after consumption, and the desired effects of a moderate dose usually subside after about three or four hours. Caffeine can delay or prevent sleep and improves task performance during sleep deprivation. Shift workers who use caffeine make fewer mistakes due to drowsiness. A systematic review and meta-analysis from 2014 found that concurrent caffeine and L-theanine use has synergistic psychoactive effects that promote alertness, attention, and task switching; these effects are most pronounced during the first hour post-dose. Caffeine is a proven ergogenic aid in humans. Caffeine improves athletic performance in aerobic (especially endurance sports) and anaerobic conditions. Moderate doses of caffeine (around 5 mg/kg) can improve sprint performance, cycling and running time trial performance, endurance (i.e., it delays the onset of muscle fatigue and central fatigue), and cycling power output. Caffeine increases basal metabolic rate in adults. Caffeine improves muscular strength and power, and may enhance muscular endurance. Caffeine also enhances performance on anaerobic tests. Caffeine consumption before constant load exercise is associated with reduced perceived exertion. While this effect is not present during to exhaustion exercise, performance is significantly enhanced. This is congruent with caffeine reducing perceived exertion, because exercise to exhaustion should end at the same point of fatigue. Caffeine also improves power output and reduces time to completion in aerobic time trials, an effect positively (but not exclusively) associated with longer duration exercise. For the general population of healthy adults, Health Canada advises a daily intake of no more than 400 mg.
Health Canada has not developed advice for adolescents because of insufficient data. However, they suggest that daily caffeine intake for this age group be no more than 2.5 mg/kg body weight. This is because the maximum adult caffeine dose may not be appropriate for light-weight adolescents or for younger adolescents who are still growing. The daily dose of 2.5 mg/kg body weight would not cause adverse health effects in the majority of adolescent caffeine consumers. This is a conservative suggestion since older and heavier weight adolescents may be able to consume adult doses of caffeine without suffering adverse effects. The UK Food Standards Agency has recommended that pregnant women should limit their caffeine intake, out of prudence, to less than 200 mg of caffeine a day – the equivalent of two cups of instant coffee, or one and a half to two cups of fresh coffee. The American Congress of Obstetricians and Gynecologists (ACOG) concluded in 2010 that caffeine consumption is safe up to 200 mg per day in pregnant women. For women who breastfeed, are pregnant, or may become pregnant, Health Canada recommends a maximum daily caffeine intake of no more than 300 mg, or a little over two 8 oz (237 mL) cups of coffee. There are conflicting reports in the scientific literature about caffeine use during pregnancy. A 2011 review found that caffeine during pregnancy does not appear to increase the risk of congenital malformations, miscarriage or growth retardation even when consumed in moderate to high amounts. Other reviews, however, concluded that there is some evidence that higher caffeine intake by pregnant women may be associated with a higher risk of giving birth to a low birth weight baby, and may be associated with a higher risk of pregnancy loss. A systematic review, analyzing the results of observational studies, suggests that women who consume large amounts of caffeine (greater than 300 mg/day) prior to becoming pregnant may have a higher risk of experiencing pregnancy loss. Caffeine can increase blood pressure and cause vasoconstriction. Coffee and caffeine can affect gastrointestinal motility and gastric acid secretion. Caffeine in low doses may cause weak bronchodilation for up to four hours in asthmatics. In postmenopausal women, high caffeine consumption can accelerate bone loss. Doses of caffeine equivalent to the amount normally found in standard servings of tea, coffee and carbonated soft drinks appear to have no diuretic action. However, acute ingestion of caffeine in large doses (at least 250–300 mg, equivalent to the amount found in 2–3 cups of coffee or 5–8 cups of tea) results in a short-term stimulation of urine output in individuals who have been deprived of caffeine for a period of days or weeks. This increase is due to both a diuresis (increase in water excretion) and a natriuresis (increase in saline excretion); it is mediated via proximal tubular adenosine receptor blockade. The acute increase in urinary output may increase the risk of dehydration. However, chronic users of caffeine develop a tolerance to this effect and experience no increase in urinary output. Minor undesired symptoms from caffeine ingestion not sufficiently severe to warrant a psychiatric diagnosis are common and include mild anxiety, jitteriness, insomnia, increased sleep latency, and reduced coordination. Caffeine can have negative effects on anxiety disorders. According to a 2011 literature review, caffeine use is positively associated with anxiety and panic disorders. At high doses, typically greater than 300 mg, caffeine can both cause and worsen anxiety. For some people, discontinuing caffeine use can significantly reduce anxiety. In moderate doses, caffeine has been associated with reduced symptoms of depression and lower suicide risk. Increased consumption of coffee and caffeine is associated with a decreased risk of depression. Some textbooks state that caffeine is a mild euphoriant, others state that it is not a euphoriant, and one states that it is and is not a euphoriant. Caffeine-induced anxiety disorder is a subclass of the DSM-5 diagnosis of substance/medication-induced anxiety disorder. Whether caffeine can result in an addictive disorder depends on how addiction is defined. Compulsive caffeine consumption under any circumstances has not been observed, and caffeine is therefore not generally considered addictive. However, some diagnostic models, such as the ICDM-9 and ICD-10, include a classification of caffeine addiction under a broader diagnostic model. Some state that certain users can become addicted and therefore unable to decrease use even though they know there are negative health effects. Caffeine does not appear to be a reinforcing stimulus, and some degree of aversion may actually occur, with people preferring placebo over caffeine in a study on drug abuse liability published in an NIDA research monograph. Some state that research does not provide support for an underlying biochemical mechanism for caffeine addiction. Other research states it can affect the reward system. "Caffeine addiction" was added to the ICDM-9 and ICD-10. However, its addition was contested with claims that this diagnostic model of caffeine addiction is not supported by evidence. The American Psychiatric Association's DSM-5 does not include the diagnosis of a caffeine addiction but proposes criteria for the disorder for more study. Withdrawal can cause mild to clinically significant distress or impairment in daily functioning. The frequency at which this occurs is self reported at 11%, but in lab tests only half of the people who report withdrawal actually experience it, casting doubt on many claims of dependence. Mild physical dependence and withdrawal symptoms may occur upon abstinence, with greater than 100 mg caffeine per day, although these symptoms last no longer than a day. some symptoms associated with psychological dependence may also occur during withdrawal. Caffeine dependence can involve withdrawal symptoms such as fatigue, headache, irritability, depressed mood, reduced contentedness, inability to concentrate, sleepiness or drowsiness, stomach pain, and joint pain. The ICD-10 includes a diagnostic model for caffeine dependence, but the DSM-5 does not. The APA, which published the DSM-5, acknowledged that there was sufficient evidence in order to create a diagnostic model of caffeine dependence for the DSM-5, but they noted that the clinical significance of this disorder is unclear. The DSM-5 instead lists "caffeine use disorder" in the emerging models section of the manual. Tolerance to the effects of caffeine occurs for caffeine induced elevations in blood pressure and the subjective feelings of nervousness. Sensitization, the process whereby effects become more prominent with use, occurs for positive effects such as feelings of alertness and well being. Tolerance varies for daily, regular caffeine users and high caffeine users. High doses of caffeine (750 to 1200 mg/day spread throughout the day) have been shown to produce complete tolerance to some, but not all of the effects of caffeine. Doses as low as 100 mg/day, such as a 6 oz cup of coffee or two to three 12 oz servings of caffeinated soft-drink, may continue to cause sleep disruption, among other intolerances. Non-regular caffeine users have the least caffeine tolerance for sleep disruption. Some coffee drinkers develop tolerance to its undesired sleep-disrupting effects, but others apparently do not. A protective effect of caffeine against Alzheimer's disease and dementia is possible but the evidence is inconclusive. It may protect people from liver cirrhosis. Caffeine may lessen the severity of acute mountain sickness if taken a few hours prior to attaining a high altitude. One meta analysis has found that caffeine consumption is associated with a reduced risk of type 2 diabetes. Two meta analyses have reported that caffeine consumption is associated with a linear reduction in risk for Parkinson's disease. Caffeine consumption may be associated with reduced risk of depression, although conflicting results have been reported. Caffeine increases intraocular pressure in those with glaucoma but does not appear to affect normal individuals. Consumption of 1–1.5 grams (1,000–1,500 mg) per day is associated with a condition known as caffeinism. Caffeinism usually combines caffeine dependency with a wide range of unpleasant symptoms including nervousness, irritability, restlessness, insomnia, headaches, and palpitations after caffeine use. Caffeine overdose can result in a state of central nervous system over-stimulation called caffeine intoxication (DSM-IV 305.90). This syndrome typically occurs only after ingestion of large amounts of caffeine, well over the amounts found in typical caffeinated beverages and caffeine tablets (e.g., more than 400–500 mg at a time). The symptoms of caffeine intoxication are comparable to the symptoms of overdoses of other stimulants: they may include restlessness, fidgeting, anxiety, excitement, insomnia, flushing of the face, increased urination, gastrointestinal disturbance, muscle twitching, a rambling flow of thought and speech, irritability, irregular or rapid heart beat, and psychomotor agitation. In cases of much larger overdoses, mania, depression, lapses in judgment, disorientation, disinhibition, delusions, hallucinations, or psychosis may occur, and rhabdomyolysis (breakdown of skeletal muscle tissue) can be provoked. Massive overdose can result in death. The LD50 of caffeine in humans is dependent on individual sensitivity, but is estimated to be 150–200 milligrams per kilogram of body mass (75–100 cups of coffee for a 70 kilogram adult). A number of fatalities have been caused by overdoses of readily available powdered caffeine supplements, for which the estimated lethal amount is less than a tablespoon. The lethal dose is lower in individuals whose ability to metabolize caffeine is impaired due to genetics or chronic liver disease. A death was reported in a man with liver cirrhosis who overdosed on caffeinated mints. Treatment of mild caffeine intoxication is directed toward symptom relief; severe intoxication may require peritoneal dialysis, hemodialysis, or hemofiltration. Caffeine is a substrate for CYP1A2, and interacts with many substances through this and other mechanisms. According to DSST, alcohol provides a reduction in performance and caffeine has a significant improvement in performance. When alcohol and caffeine are consumed jointly, the effects produced by caffeine are affected, but the alcohol effects remain the same. For example, when additional caffeine is added, the drug effect produced by alcohol is not reduced. However, the jitteriness and alertness given by caffeine is decreased when additional alcohol is consumed. Alcohol consumption alone reduces both inhibitory and activational aspects of behavioral control. Caffeine antagonizes the activational aspect of behavioral control, but has no effect on the inhibitory behavioral control. The Dietary Guidelines for Americans recommend avoidance of concomitant consumption of alcohol and caffeine, as this may lead to increased alcohol consumption, with a higher risk of alcohol-associated injury. Smoking tobacco increases caffeine clearance by 56%. Birth control pills can extend the half-life of caffeine, requiring greater attention to caffeine consumption. Caffeine sometimes increases the effectiveness of some medications, such as those for headaches. Caffeine was determined to increase the potency of some over-the-counter analgesic medications by 40%. The pharmacological effects of adenosine may be blunted in individuals taking large quantities of methylxanthines like caffeine. In the absence of caffeine and when a person is awake and alert, little adenosine is present in (CNS) neurons. With a continued wakeful state, over time it accumulates in the neuronal synapse, in turn binding to and activating adenosine receptors found on certain CNS neurons; when activated, these receptors produce a cellular response that ultimately increases drowsiness. When caffeine is consumed, it antagonizes adenosine receptors; in other words, caffeine prevents adenosine from activating the receptor by blocking the location on the receptor where adenosine binds to it. As a result, caffeine temporarily prevents or relieves drowsiness, and thus maintains or restores alertness. Caffeine is an antagonist at all four adenosine receptor subtypes (A1, A2A, A2B, and A3), although with varying potencies. The affinity (KD) values of caffeine for the human adenosine receptors are 12 μM at A1, 2.4 μM at A2A, 13 μM at A2B, and 80 μM at A3. Knockout mouse studies have specifically implicated antagonism of the A2A receptor as responsible for the wakefulness-promoting effects of caffeine. Antagonism of adenosine receptors by caffeine stimulates the medullary vagal, vasomotor, and respiratory centers, which increases respiratory rate, reduces heart rate, and constricts blood vessels. Adenosine receptor antagonism also promotes neurotransmitter release (e.g., monoamines and acetylcholine), which endows caffeine with its stimulant effects; adenosine acts as an inhibitory neurotransmitter that suppresses activity in the central nervous system. Heart palpitations are caused by blockade of the A1 receptor. Because caffeine is both water- and lipid-soluble, it readily crosses the blood–brain barrier that separates the bloodstream from the interior of the brain. Once in the brain, the principal mode of action is as a nonselective antagonist of adenosine receptors (in other words, an agent that reduces the effects of adenosine). The caffeine molecule is structurally similar to adenosine, and is capable of binding to adenosine receptors on the surface of cells without activating them, thereby acting as a competitive antagonist. In addition to its activity at adenosine receptors, caffeine is an inositol trisphosphate receptor 1 antagonist and a voltage-independent activator of the ryanodine receptors (RYR1, RYR2, and RYR3). It is also a competitive antagonist of the ionotropic glycine receptor. While caffeine does not directly bind to any dopamine receptors, it influences the binding activity of dopamine at its receptors in the striatum by binding to adenosine receptors that have formed GPCR heteromers with dopamine receptors, specifically the A1–D1 receptor heterodimer (this is a receptor complex with 1 adenosine A1 receptor and 1 dopamine D1 receptor) and the A2A–D2 receptor heterotetramer (this is a receptor complex with 2 adenosine A2A receptors and 2 dopamine D2 receptors). The A2A–D2 receptor heterotetramer has been identified as a primary pharmacological target of caffeine, primarily because it mediates some of its psychostimulant effects and its pharmacodynamic interactions with dopaminergic psychostimulants. 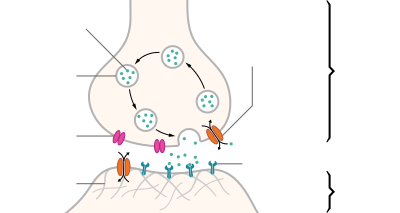 Caffeine also causes the release of dopamine in the dorsal striatum and nucleus accumbens core (a substructure within the ventral striatum), but not the nucleus accumbens shell, by antagonizing A1 receptors in the axon terminal of dopamine neurons and A1–A2A heterodimers (a receptor complex composed of 1 adenosine A1 receptor and 1 adenosine A2A receptor) in the axon terminal of glutamate neurons. During chronic caffeine use, caffeine-induced dopamine release within the nucleus accumbens core is markedly reduced due to drug tolerance. Caffeine, like other xanthines, also acts as a phosphodiesterase inhibitor. As a competitive nonselective phosphodiesterase inhibitor, caffeine raises intracellular cAMP, activates protein kinase A, inhibits TNF-alpha and leukotriene synthesis, and reduces inflammation and innate immunity. Caffeine also affects the cholinergic system where it inhibits the enzyme acetylcholinesterase. Caffeine antagonizes adenosine A2A receptors in the ventrolateral preoptic area (VLPO), thereby reducing inhibitory GABA neurotransmission to the tuberomammillary nucleus, a histaminergic projection nucleus that activation-dependently promotes arousal. Disinhibition of the tuberomammillary nucleus is the chief mechanism by which caffeine produces wakefulness-promoting effects. Caffeine is metabolized in the liver via a single demethylation, resulting in three primary metabolites, paraxanthine (84%), theobromine (12%), and theophylline (4%), depending on which methyl group is removed. Urinary metabolites of caffeine in humans at 48 hours post-dose. Caffeine from coffee or other beverages is absorbed by the small intestine within 45 minutes of ingestion and distributed throughout all bodily tissues. Peak blood concentration is reached within 1–2 hours. It is eliminated by first-order kinetics. Caffeine can also be absorbed rectally, evidenced by suppositories of ergotamine tartrate and caffeine (for the relief of migraine) and chlorobutanol and caffeine (for the treatment of hyperemesis). However, rectal absorption is less efficient than oral: the maximum concentration (Cmax) and total amount absorbed (AUC) are both about 30% (i.e., 1/3.5) of the oral amounts. Caffeine's biological half-life – the time required for the body to eliminate one-half of a dose – varies widely among individuals according to factors such as pregnancy, other drugs, liver enzyme function level (needed for caffeine metabolism) and age. In healthy adults, caffeine's half-life is between 3–7 hours. Smoking decreases the half-life by 30–50%, while oral contraceptives can double it and pregnancy can raise it to as much as 15 hours during the third trimester. In newborns the half-life can be 80 hours or more, dropping very rapidly with age, possibly to less than the adult value by age 6 months. The antidepressant fluvoxamine (Luvox) reduces the clearance of caffeine by more than 90%, and increases its elimination half-life more than tenfold; from 4.9 hours to 56 hours. Paraxanthine (84%): Increases lipolysis, leading to elevated glycerol and free fatty acid levels in blood plasma. Theobromine (12%): Dilates blood vessels and increases urine volume. Theobromine is also the principal alkaloid in the cocoa bean (chocolate). Theophylline (4%): Relaxes smooth muscles of the bronchi, and is used to treat asthma. The therapeutic dose of theophylline, however, is many times greater than the levels attained from caffeine metabolism. 1,3,7-Trimethyluric acid is a minor caffeine metabolite. Each of these metabolites is further metabolized and then excreted in the urine. Caffeine can accumulate in individuals with severe liver disease, increasing its half-life. A 2011 review found that increased caffeine intake was associated with a variation in two genes that increase the rate of caffeine catabolism. Subjects who had this mutation on both chromosomes consumed 40 mg more caffeine per day than others. This is presumably due to the need for a higher intake to achieve a comparable desired effect, not that the gene led to a disposition for greater incentive of habituation. Pure anhydrous caffeine is a bitter-tasting, white, odorless powder with a melting point of 235–238 °C. Caffeine is moderately soluble in water at room temperature (2 g/100 mL), but very soluble in boiling water (66 g/100 mL). It is also moderately soluble in ethanol (1.5 g/100 mL). It is weakly basic (pKa of conjugate acid = ~0.6) requiring strong acid to protonate it. Caffeine does not contain any stereogenic centers and hence is classified as an achiral molecule. The xanthine core of caffeine contains two fused rings, a pyrimidinedione and imidazole. 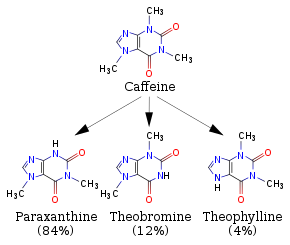 The pyrimidinedione in turn contains two amide functional groups that exist predominantly in a zwitterionic resonance the location from which the nitrogen atoms are double bonded to their adjacent amide carbons atoms. Hence all six of the atoms within the pyrimidinedione ring system are sp2 hybridized and planar. Therefore, the fused 5,6 ring core of caffeine contains a total of ten pi electrons and hence according to Hückel's rule is aromatic. One biosynthetic route of caffeine, as performed by Camellia and Coffea species. The biosynthesis of caffeine is an example of convergent evolution among different species. Commercial supplies of caffeine are not usually manufactured synthetically because the chemical is readily available as a byproduct of decaffeination. Water extraction: Coffee beans are soaked in water. The water, which contains many other compounds in addition to caffeine and contributes to the flavor of coffee, is then passed through activated charcoal, which removes the caffeine. The water can then be put back with the beans and evaporated dry, leaving decaffeinated coffee with its original flavor. Coffee manufacturers recover the caffeine and resell it for use in soft drinks and over-the-counter caffeine tablets. 2 is then sprayed with high-pressure water to remove the caffeine. The caffeine can then be isolated by charcoal adsorption (as above) or by distillation, recrystallization, or reverse osmosis. Extraction by organic solvents: Certain organic solvents such as ethyl acetate present much less health and environmental hazard than chlorinated and aromatic organic solvents used formerly. Another method is to use triglyceride oils obtained from spent coffee grounds. "Decaffeinated" coffees do in fact contain caffeine in many cases – some commercially available decaffeinated coffee products contain considerable levels. One study found that decaffeinated coffee contained 10 mg of caffeine per cup, compared to approximately 85 mg of caffeine per cup for regular coffee. Caffeine can be quantified in blood, plasma, or serum to monitor therapy in neonates, confirm a diagnosis of poisoning, or facilitate a medicolegal death investigation. Plasma caffeine levels are usually in the range of 2–10 mg/L in coffee drinkers, 12–36 mg/L in neonates receiving treatment for apnea, and 40–400 mg/L in victims of acute overdosage. Urinary caffeine concentration is frequently measured in competitive sports programs, for which a level in excess of 15 mg/L is usually considered to represent abuse. Some analog substances have been created which mimic caffeine's properties with either function or structure or both. Of the latter group are the xanthines DMPX and 8-chlorotheophylline, which is an ingredient in dramamine. Members of a class of nitrogen substituted xanthines are often proposed as potential alternatives to caffeine. [unreliable source?] Many other xanthine analogues constituting the adenosine receptor antagonist class have also been elucidated. Caffeine, as do other alkaloids such as cinchonine, quinine or strychnine, precipitates polyphenols and tannins. This property can be used in a quantitation method. Around sixty plant species are known to contain caffeine. Common sources are the "beans" (seeds) of the two cultivated coffee plants, Coffea arabica and Coffea canephora (the quantity varies, but 1.3% is a typical value); in the leaves of the tea plant; and in kola nuts. Other sources include yaupon holly leaves, South American holly yerba mate leaves, seeds from Amazonian maple guarana berries, and Amazonian holly guayusa leaves. Temperate climates around the world have produced unrelated caffeine-containing plants. Caffeine in plants acts as a natural pesticide: it can paralyze and kill predator insects feeding on the plant. High caffeine levels are found in coffee seedlings when they are developing foliage and lack mechanical protection. In addition, high caffeine levels are found in the surrounding soil of coffee seedlings, which inhibits seed germination of nearby coffee seedlings, thus giving seedlings with the highest caffeine levels fewer competitors for existing resources for survival. Caffeine is stored in tea leaves in two places. Firstly, in the cell vacuoles where it is complexed with polyphenols. This caffeine probably is released into the mouth parts of insects, to discourage herbivory. Secondly, around the vascular bundles, where it probably inhibits pathogenic fungi from entering and colonizing the vascular bundles. Caffeine in nectar may improve the reproductive success of the pollen producing plants by enhancing the reward memory of pollinators such as honey bees. Products containing caffeine are coffee, tea, soft drinks ("colas"), energy drinks, other beverages, chocolate, caffeine tablets, other oral products, and inhalation. The world's primary source of caffeine is the coffee "bean" (the seed of the coffee plant), from which coffee is brewed. Caffeine content in coffee varies widely depending on the type of coffee bean and the method of preparation used; even beans within a given bush can show variations in concentration. In general, one serving of coffee ranges from 80 to 100 milligrams, for a single shot (30 milliliters) of arabica-variety espresso, to approximately 100–125 milligrams for a cup (120 milliliters) of drip coffee. Arabica coffee typically contains half the caffeine of the robusta variety. In general, dark-roast coffee has very slightly less caffeine than lighter roasts because the roasting process reduces caffeine content of the bean by a small amount. Tea contains more caffeine than coffee by dry weight. A typical serving, however, contains much less, since less of the product is used as compared to an equivalent serving of coffee. Also contributing to caffeine content are growing conditions, processing techniques, and other variables. Thus, teas contain varying amounts of caffeine. Tea contains small amounts of theobromine and slightly higher levels of theophylline than coffee. Preparation and many other factors have a significant impact on tea, and color is a very poor indicator of caffeine content. Teas like the pale Japanese green tea, gyokuro, for example, contain far more caffeine than much darker teas like lapsang souchong, which has very little. Caffeine is also a common ingredient of soft drinks, such as cola, originally prepared from kola nuts. Soft drinks typically contain 0 to 55 milligrams of caffeine per 12 ounce serving. By contrast, energy drinks, such as Red Bull, can start at 80 milligrams of caffeine per serving. The caffeine in these drinks either originates from the ingredients used or is an additive derived from the product of decaffeination or from chemical synthesis. Guarana, a prime ingredient of energy drinks, contains large amounts of caffeine with small amounts of theobromine and theophylline in a naturally occurring slow-release excipient. Mate is a drink popular in many parts of South America. Its preparation consists of filling a gourd with the leaves of the South American holly yerba mate, pouring hot but not boiling water over the leaves, and drinking with a straw, the bombilla, which acts as a filter so as to draw only the liquid and not the yerba leaves. Guaraná seeds ("beans") are used in making the commercially sold beverage Guaraná Antarctica, which originated in Brazil and is currently the fifteenth most popular soft drink in the world. Chocolate derived from cocoa beans contains a small amount of caffeine. The weak stimulant effect of chocolate may be due to a combination of theobromine and theophylline, as well as caffeine. A typical 28-gram serving of a milk chocolate bar has about as much caffeine as a cup of decaffeinated coffee. By weight, dark chocolate has one to two times the amount of caffeine as coffee: 80–160 mg per 100 g. Higher percentages of cocoa such as 90% amount to 200 mg per 100 g approximately and thus, a 100-gram 85% cocoa chocolate bar contains about 195 mg caffeine. Tablets offer several advantages over coffee, tea, and other caffeinated beverages, including convenience, known dosage, and avoidance of concomitant intake of sugar, acids, and fluids. Manufacturers of caffeine tablets claim that using caffeine of pharmaceutical quality improves mental alertness. These tablets are commonly used by students studying for their exams and by people who work or drive for long hours. One U.S. company is marketing oral dissolvable caffeine strips. Another intake route is SpazzStick, a caffeinated lip balm. Alert Energy Caffeine Gum was introduced in the United States in 2013, but was voluntarily withdrawn after an announcement of an investigation by the FDA of the health effects of added caffeine in foods. There are several products being marketed that offer inhalers that deliver proprietary blends of supplements, with caffeine being a key ingredient. In 2012, the FDA sent a warning letter to one of the companies marketing these inhalers, expressing concerns for the lack of safety information available about inhaled caffeine. Some beverages combine alcohol with caffeine to create a caffeinated alcoholic drink. The stimulant effects of caffeine may mask the depressant effects of alcohol, potentially reducing the user's awareness of their level of intoxication. Such beverages have been the subject of bans due to safety concerns. In particular, the United States Food and Drug Administration has classified caffeine added to malt liquor beverages as an "unsafe food additive". Ya ba contains a combination of methamphetamine and caffeine. Painkillers such as propyphenazone/paracetamol/caffeine combine caffeine with an analgesic. According to Chinese legend, the Chinese emperor Shennong, reputed to have reigned in about 3000 BCE, inadvertently discovered tea when he noted that when certain leaves fell into boiling water, a fragrant and restorative drink resulted. Shennong is also mentioned in Lu Yu's Cha Jing, a famous early work on the subject of tea. 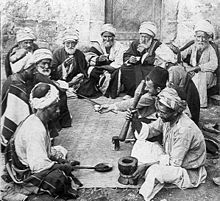 The earliest credible evidence of either coffee drinking or knowledge of the coffee plant appears in the middle of the fifteenth century, in the Sufi monasteries of the Yemen in southern Arabia. From Mocha, coffee spread to Egypt and North Africa, and by the 16th century, it had reached the rest of the Middle East, Persia and Turkey. From the Middle East, coffee drinking spread to Italy, then to the rest of Europe, and coffee plants were transported by the Dutch to the East Indies and to the Americas. Kola nut use appears to have ancient origins. It is chewed in many West African cultures, in both private and social settings, to restore vitality and ease hunger pangs. The earliest evidence of cocoa bean use comes from residue found in an ancient Mayan pot dated to 600 BCE. Also, chocolate was consumed in a bitter and spicy drink called xocolatl, often seasoned with vanilla, chile pepper, and achiote. Xocolatl was believed to fight fatigue, a belief probably attributable to the theobromine and caffeine content. Chocolate was an important luxury good throughout pre-Columbian Mesoamerica, and cocoa beans were often used as currency. Xocolatl was introduced to Europe by the Spaniards, and became a popular beverage by 1700. The Spaniards also introduced the cacao tree into the West Indies and the Philippines. It was used in alchemical processes, where it was known as "black bean". The leaves and stems of the yaupon holly (Ilex vomitoria) were used by Native Americans to brew a tea called asi or the "black drink". Archaeologists have found evidence of this use far into antiquity, possibly dating to Late Archaic times. In 1819, the German chemist Friedlieb Ferdinand Runge isolated relatively pure caffeine for the first time; he called it "Kaffebase" (i.e., a base that exists in coffee). According to Runge, he did this at the behest of Johann Wolfgang von Goethe. In 1821, caffeine was isolated both by the French chemist Pierre Jean Robiquet and by another pair of French chemists, Pierre-Joseph Pelletier and Joseph Bienaimé Caventou, according to Swedish chemist Jöns Jacob Berzelius in his yearly journal. Furthermore, Berzelius stated that the French chemists had made their discoveries independently of any knowledge of Runge's or each other's work. However, Berzelius later acknowledged Runge's priority in the extraction of caffeine, stating: "However, at this point, it should not remain unmentioned that Runge (in his Phytochemical Discoveries, 1820, pages 146–147) specified the same method and described caffeine under the name Caffeebase a year earlier than Robiquet, to whom the discovery of this substance is usually attributed, having made the first oral announcement about it at a meeting of the Pharmacy Society in Paris." Robiquet was one of the first to isolate and describe the properties of pure caffeine, whereas Pelletier was the first to perform an elemental analysis. In 1827, M. Oudry isolated "théine" from tea, but in 1838 it was proved by Mulder and by Carl Jobst that theine was actually the same as caffeine. In 1895, German chemist Hermann Emil Fischer (1852–1919) first synthesized caffeine from its chemical components (i.e. a "total synthesis"), and two years later, he also derived the structural formula of the compound. This was part of the work for which Fischer was awarded the Nobel Prize in 1902. Because it was recognized that coffee contained some compound that acted as a stimulant, first coffee and later also caffeine has sometimes been subject to regulation. For example, in the 16th century Islamists in Mecca and in the Ottoman Empire made coffee illegal for some classes. Charles II of England tried to ban it in 1676, Frederick II of Prussia banned it in 1777, and coffee was banned in Sweden at various times between 1756 and 1823. In 1911, caffeine became the focus of one of the earliest documented health scares, when the US government seized 40 barrels and 20 kegs of Coca-Cola syrup in Chattanooga, Tennessee, alleging the caffeine in its drink was "injurious to health". Although the judge ruled in favor of Coca-Cola, two bills were introduced to the U.S. House of Representatives in 1912 to amend the Pure Food and Drug Act, adding caffeine to the list of "habit-forming" and "deleterious" substances, which must be listed on a product's label. The Food and Drug Administration (FDA) in the United States currently allows only beverages containing less than 0.02% caffeine; but caffeine powder, which is sold as a dietary supplement, is unregulated. It is a regulatory requirement that the label of most prepackaged foods must declare a list of ingredients, including food additives such as caffeine, in descending order of proportion. However, there is no regulatory provision for mandatory quantitative labeling of caffeine, (e.g., milligrams caffeine per stated serving size). There are a number of food ingredients that naturally contain caffeine. These ingredients must appear in food ingredient lists. However, as is the case for "food additive caffeine", there is no requirement to identify the quantitative amount of caffeine in composite foods containing ingredients that are natural sources of caffeine. While coffee or chocolate are broadly recognized as caffeine sources, some ingredients (e.g., guarana, yerba maté) are likely less recognized as caffeine sources. For these natural sources of caffeine, there is no regulatory provision requiring that a food label identify the presence of caffeine nor state the amount of caffeine present in the food. Global consumption of caffeine has been estimated at 120,000 tonnes per year, making it the world's most popular psychoactive substance. This amounts to one serving of a caffeinated beverage for every person every day. Some Church of God (Restoration) adherents, and Christian Scientists do not consume caffeine. Until recently, the Seventh-day Adventist Church asked for its members to "abstain from caffeinated drinks", but has removed this from baptismal vows (while still recommending abstention as policy). Some from these religions believe that one is not supposed to consume a non-medical, psychoactive substance, or believe that one is not supposed to consume a substance that is addictive. The Church of Jesus Christ of Latter-day Saints has said the following with regard to caffeinated beverages: " . . . the Church revelation spelling out health practices (Doctrine and Covenants 89) does not mention the use of caffeine. The Church's health guidelines prohibit alcoholic drinks, smoking or chewing of tobacco, and 'hot drinks' – taught by Church leaders to refer specifically to tea and coffee." Gaudiya Vaishnavas generally also abstain from caffeine, because they believe it clouds the mind and over-stimulates the senses. To be initiated under a guru, one must have had no caffeine, alcohol, nicotine or other drugs, for at least a year. Caffeinated beverages are widely consumed by Muslims today. In the 16th century, some Muslim authorities made unsuccessful attempts to ban them as forbidden "intoxicating beverages" under Islamic dietary laws. Recently discovered bacteria Pseudomonas putida CBB5 can live on pure caffeine and can cleave caffeine into carbon dioxide and ammonia. Caffeine is toxic to birds and to dogs and cats, and has a pronounced adverse effect on mollusks, various insects, and spiders. This is at least partly due to a poor ability to metabolize the compound, causing higher levels for a given dose per unit weight. Caffeine has also been found to enhance the reward memory of honey bees. Caffeine has been used to double chromosomes in haploid wheat. ^ a b c d e f g Malenka RC, Nestler EJ, Hyman SE (2009). "Chapter 15: Reinforcement and Addictive Disorders". In Sydor A, Brown RY (eds.). Molecular Neuropharmacology: A Foundation for Clinical Neuroscience (2nd ed.). New York: McGraw-Hill Medical. p. 375. ISBN 978-0-07-148127-4. Long-term caffeine use can lead to mild physical dependence. A withdrawal syndrome characterized by drowsiness, irritability, and headache typically lasts no longer than a day. True compulsive use of caffeine has not been documented. ^ a b c Karch SB (2009). Karch's pathology of drug abuse (4th ed.). Boca Raton: CRC Press. pp. 229–230. ISBN 978-0-8493-7881-2. The suggestion has also been made that a caffeine dependence syndrome exists ... In one controlled study, dependence was diagnosed in 16 of 99 individuals who were evaluated. The median daily caffeine consumption of this group was only 357 mg per day (Strain et al., 1994). ^ a b c d e f American Psychiatric Association (2013). "Substance-Related and Addictive Disorders" (PDF). American Psychiatric Publishing. pp. 1–2. Archived from the original (PDF) on 15 August 2015. Retrieved 10 July 2015. Substance use disorder in DSM-5 combines the DSM-IV categories of substance abuse and substance dependence into a single disorder measured on a continuum from mild to severe. ... Additionally, the diagnosis of dependence caused much confusion. Most people link dependence with "addiction" when in fact dependence can be a normal body response to a substance. ... DSM-5 will not include caffeine use disorder, although research shows that as little as two to three cups of coffee can trigger a withdrawal effect marked by tiredness or sleepiness. There is sufficient evidence to support this as a condition, however it is not yet clear to what extent it is a clinically significant disorder. ^ a b Introduction to Pharmacology (third ed.). Abingdon: CRC Press. 2007. pp. 222–223. ISBN 978-1-4200-4742-4. ^ a b c d Juliano LM, Griffiths RR (October 2004). "A critical review of caffeine withdrawal: empirical validation of symptoms and signs, incidence, severity, and associated features" (PDF). Psychopharmacology. 176 (1): 1–29. doi:10.1007/s00213-004-2000-x. PMID 15448977. Archived from the original (PDF) on 29 January 2012. Results: Of 49 symptom categories identified, the following 10 fulfilled validity criteria: headache, fatigue, decreased energy/ activeness, decreased alertness, drowsiness, decreased contentedness, depressed mood, difficulty concentrating, irritability, and foggy/not clearheaded. In addition, flu-like symptoms, nausea/vomiting, and muscle pain/stiffness were judged likely to represent valid symptom categories. In experimental studies, the incidence of headache was 50% and the incidence of clinically significant distress or functional impairment was 13%. Typically, onset of symptoms occurred 12–24 h after abstinence, with peak intensity at 20–51 h, and for a duration of 2–9 days. ^ a b c d e f g h i j k l m n o "Caffeine". DrugBank. University of Alberta. 16 September 2013. Retrieved 8 August 2014. ^ a b c d Poleszak E, Szopa A, Wyska E, Kukuła-Koch W, Serefko A, Wośko S, Bogatko K, Wróbel A, Wlaź P (February 2016). "Caffeine augments the antidepressant-like activity of mianserin and agomelatine in forced swim and tail suspension tests in mice". Pharmacological Reports. 68 (1): 56–61. doi:10.1016/j.pharep.2015.06.138. PMID 26721352. ^ a b "Caffeine". Pubchem Compound. NCBI. Retrieved 16 October 2014. ^ a b Nehlig A, Daval JL, Debry G (1992). "Caffeine and the central nervous system: mechanisms of action, biochemical, metabolic and psychostimulant effects". Brain Research. Brain Research Reviews. 17 (2): 139–70. doi:10.1016/0165-0173(92)90012-B. PMID 1356551. ^ Caballero, B.; Finglas, P.; Toldra, F. (2015). Encyclopedia of Food and Health. Elsevier Science. p. 561. ISBN 978-0-12-384953-3. Retrieved 17 June 2018. ^ Myers, R.L. (2007). The 100 Most Important Chemical Compounds: A Reference Guide. Greenwood Press. p. 55. ISBN 978-0-313-33758-1. Retrieved 17 June 2018. ^ Mitchell DC, Knight CA, Hockenberry J, Teplansky R, Hartman TJ (January 2014). "Beverage caffeine intakes in the U.S". Food and Chemical Toxicology. 63: 136–42. doi:10.1016/j.fct.2013.10.042. PMID 24189158. ^ WHO Model List of Essential Medicines (PDF) (18th ed.). World Health Organization. October 2013 [April 2013]. p. 34 [p. 38 of pdf]. Retrieved 23 December 2014. ^ Cano-Marquina A, Tarín JJ, Cano A (May 2013). "The impact of coffee on health". Maturitas. 75 (1): 7–21. doi:10.1016/j.maturitas.2013.02.002. PMID 23465359. ^ a b Qi H, Li S (April 2014). "Dose-response meta-analysis on coffee, tea and caffeine consumption with risk of Parkinson's disease". Geriatrics & Gerontology International. 14 (2): 430–9. doi:10.1111/ggi.12123. PMID 23879665. ^ Mayo Clinic staff. "Pregnancy Nutrition: Foods to avoid during pregnancy". Mayo Clinic. Retrieved 15 April 2012. ^ a b American College of Obstetricians and Gynecologists (August 2010). "ACOG CommitteeOpinion No. 462: Moderate caffeine consumption during pregnancy". Obstetrics and Gynecology. 116 (2 Pt 1): 467–8. doi:10.1097/AOG.0b013e3181eeb2a1. PMID 20664420. ^ Robertson D, Wade D, Workman R, Woosley RL, Oates JA (April 1981). "Tolerance to the humoral and hemodynamic effects of caffeine in man". The Journal of Clinical Investigation. 67 (4): 1111–7. doi:10.1172/JCI110124. PMC 370671. PMID 7009653. ^ Heckman, Melanie A.; Weil, Jorge; De Mejia, Elvira Gonzalez (2010). "Caffeine (1, 3, 7-trimethylxanthine) in Foods: A Comprehensive Review on Consumption, Functionality, Safety, and Regulatory Matters". Journal of Food Science. 75 (3): R77–R87. doi:10.1111/j.1750-3841.2010.01561.x. PMID 20492310. ^ Kugelman A, Durand M (December 2011). "A comprehensive approach to the prevention of bronchopulmonary dysplasia". Pediatric Pulmonology. 46 (12): 1153–65. doi:10.1002/ppul.21508. PMID 21815280. ^ Schmidt B (2005). "Methylxanthine therapy for apnea of prematurity: evaluation of treatment benefits and risks at age 5 years in the international Caffeine for Apnea of Prematurity (CAP) trial". Biology of the Neonate. 88 (3): 208–13. doi:10.1159/000087584. PMID 16210843. ^ Schmidt B, Roberts RS, Davis P, Doyle LW, Barrington KJ, Ohlsson A, Solimano A, Tin W (May 2006). "Caffeine therapy for apnea of prematurity". The New England Journal of Medicine. 354 (20): 2112–21. doi:10.1056/NEJMoa054065. PMID 16707748. ^ Schmidt B, Roberts RS, Davis P, Doyle LW, Barrington KJ, Ohlsson A, Solimano A, Tin W (November 2007). "Long-term effects of caffeine therapy for apnea of prematurity". The New England Journal of Medicine. 357 (19): 1893–902. doi:10.1056/NEJMoa073679. PMID 17989382. ^ Schmidt B, Anderson PJ, Doyle LW, Dewey D, Grunau RE, Asztalos EV, Davis PG, Tin W, Moddemann D, Solimano A, Ohlsson A, Barrington KJ, Roberts RS (January 2012). "Survival without disability to age 5 years after neonatal caffeine therapy for apnea of prematurity". JAMA. 307 (3): 275–82. doi:10.1001/jama.2011.2024. PMID 22253394. ^ Funk GD (November 2009). "Losing sleep over the caffeination of prematurity". The Journal of Physiology. 587 (Pt 22): 5299–300. doi:10.1113/jphysiol.2009.182303. PMC 2793860. PMID 19915211. ^ Mathew OP (May 2011). "Apnea of prematurity: pathogenesis and management strategies". Journal of Perinatology. 31 (5): 302–10. doi:10.1038/jp.2010.126. PMID 21127467. ^ Henderson-Smart DJ, De Paoli AG (December 2010). "Prophylactic methylxanthine for prevention of apnoea in preterm infants". The Cochrane Database of Systematic Reviews (12): CD000432. doi:10.1002/14651858.CD000432.pub2. PMID 21154344. ^ a b "Caffeine: Summary of Clinical Use". IUPHAR Guide to Pharmacology. The International Union of Basic and Clinical Pharmacology. Retrieved 13 February 2015. ^ Gibbons CH, Schmidt P, Biaggioni I, Frazier-Mills C, Freeman R, Isaacson S, Karabin B, Kuritzky L, Lew M, Low P, Mehdirad A, Raj SR, Vernino S, Kaufmann H (August 2017). "The recommendations of a consensus panel for the screening, diagnosis, and treatment of neurogenic orthostatic hypotension and associated supine hypertension". J. Neurol. 264 (8): 1567–1582. doi:10.1007/s00415-016-8375-x. PMC 5533816. PMID 28050656. ^ Gupta V, Lipsitz LA (October 2007). "Orthostatic hypotension in the elderly: diagnosis and treatment". The American Journal of Medicine. 120 (10): 841–7. doi:10.1016/j.amjmed.2007.02.023. PMID 17904451. ^ a b Alfaro TM, Monteiro RA, Cunha RA, Cordeiro CR (March 2018). 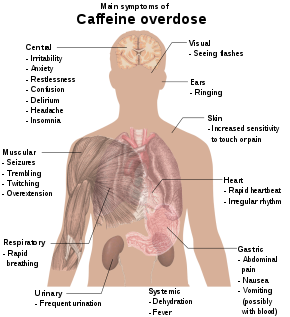 "Chronic coffee consumption and respiratory disease: A systematic review". Clin Respir J. 12 (3): 1283–1294. doi:10.1111/crj.12662. PMID 28671769. ^ Welsh EJ, Bara A, Barley E, Cates CJ (January 2010). "Caffeine for asthma". Cochrane Database Syst Rev (1): CD001112. doi:10.1002/14651858.CD001112.pub2. PMID 20091514. ^ a b c Bolton, Sanford; Null, Gary (1981). "Caffeine: Psychological Effects, Use and Abuse" (PDF). Orthomolecular Psychiatry. 10 (3): 202–211. ^ Nehlig A (2010). "Is caffeine a cognitive enhancer?". Journal of Alzheimer's Disease. 20 Suppl 1: S85–94. doi:10.3233/JAD-2010-091315. PMID 20182035. Caffeine does not usually affect performance in learning and memory tasks, although caffeine may occasionally have facilitatory or inhibitory effects on memory and learning. Caffeine facilitates learning in tasks in which information is presented passively; in tasks in which material is learned intentionally, caffeine has no effect. Caffeine facilitates performance in tasks involving working memory to a limited extent, but hinders performance in tasks that heavily depend on this, and caffeine appears to improve memory performance under suboptimal alertness. Most studies, however, found improvements in reaction time. The ingestion of caffeine does not seem to affect long-term memory. ... Its indirect action on arousal, mood and concentration contributes in large part to its cognitive enhancing properties. ^ Snel, Jan; Lorist, Monicque M. (2011). Effects of caffeine on sleep and cognition. Progress in Brain Research. 190. pp. 105–17. doi:10.1016/B978-0-444-53817-8.00006-2. ISBN 978-0-444-53817-8. PMID 21531247. ^ Ker, K; Edwards, PJ; Felix, LM; Blackhall, K; Roberts, I (May 2010). Ker, Katharine (ed.). "Caffeine for the prevention of injuries and errors in shift workers". The Cochrane Database of Systematic Reviews (5): CD008508. doi:10.1002/14651858.CD008508. PMC 4160007. PMID 20464765. ^ a b Camfield DA, Stough C, Farrimond J, Scholey AB (August 2014). "Acute effects of tea constituents L-theanine, caffeine, and epigallocatechin gallate on cognitive function and mood: a systematic review and meta-analysis". Nutrition Reviews. 72 (8): 507–22. doi:10.1111/nure.12120. PMID 24946991. ^ a b c d e f Pesta DH, Angadi SS, Burtscher M, Roberts CK (December 2013). "The effects of caffeine, nicotine, ethanol, and tetrahydrocannabinol on exercise performance". Nutrition & Metabolism. 10 (1): 71. doi:10.1186/1743-7075-10-71. PMC 3878772. PMID 24330705. Caffeine-induced increases in performance have been observed in aerobic as well as anaerobic sports (for reviews, see [26,30,31]). Trained athletes seem to benefit from a moderate dose of 5 mg/kg , however, even lower doses of caffeine (1.0–2.0 mg/kg) may improve performance . Some groups found significantly improved time trial performance  or maximal cycling power , most likely related to a greater reliance on fat metabolism and decreased neuromuscular fatigue, respectively. Theophylline, a metabolite of caffeine, seems to be even more effective in doing so . The effect of caffeine on fat oxidation, however, may only be significant during lower exercise intensities and may be blocked at higher intensities . ... For both caffeine-naïve as well as caffeine-habituated subjects, moderate to high doses of caffeine are ergogenic during prolonged moderate intensity exercise . ... In summary, caffeine, even at physiological doses (3–6 mg/kg), as well as coffee are proven ergogenic aids and as such – in most exercise situations, especially in endurance-type events – clearly work-enhancing . It most likely has a peripheral effect targeting skeletal muscle metabolism as well as a central effect targeting the brain to enhance performance, especially during endurance events (see Table 1). Also for anaerobic tasks, the effect of caffeine on the CNS might be most relevant. ... Muendel et al. found a 17% improvement in time to exhaustion after nicotine patch application compared to a placebo without affecting cardiovascular and respiratory parameters or substrate metabolism. In this sense, nicotine seems to exert similar effects as caffeine by delaying the development of central fatigue as impaired central drive is an important factor contributing to fatigue during exercise. ... The physiological effects of the above mentioned substances are well established. However, the ergogenic effect of some of the discussed drugs may be questioned and one has to consider the cohort tested for every specific substance. However, only caffeine has enough strength of evidence to be considered an ergogenic aid. ^ Bishop D (December 2010). "Dietary supplements and team-sport performance". Sports Medicine. 40 (12): 995–1017. doi:10.2165/11536870-000000000-00000. PMID 21058748. ^ Conger SA, Warren GL, Hardy MA, Millard-Stafford ML (February 2011). "Does caffeine added to carbohydrate provide additional ergogenic benefit for endurance?". International Journal of Sport Nutrition and Exercise Metabolism. 21 (1): 71–84. doi:10.1123/ijsnem.21.1.71. PMID 21411838. ^ Acheson KJ, Zahorska-Markiewicz B, Pittet P, Anantharaman K, Jéquier E (May 1980). "Caffeine and coffee: their influence on metabolic rate and substrate utilization in normal weight and obese individuals". The American Journal of Clinical Nutrition. 33 (5): 989–97. doi:10.1093/ajcn/33.5.989. PMID 7369170. ^ Dulloo AG, Geissler CA, Horton T, Collins A, Miller DS (January 1989). "Normal caffeine consumption: influence on thermogenesis and daily energy expenditure in lean and postobese human volunteers". The American Journal of Clinical Nutrition. 49 (1): 44–50. doi:10.1093/ajcn/49.1.44. PMID 2912010. ^ Koot P, Deurenberg P (1995). "Comparison of changes in energy expenditure and body temperatures after caffeine consumption". Annals of Nutrition & Metabolism. 39 (3): 135–42. doi:10.1159/000177854. PMID 7486839. ^ Grgic J, Trexler ET, Lazinica B, Pedisic Z (2018). "Effects of caffeine intake on muscle strength and power: a systematic review and meta-analysis". Journal of the International Society of Sports Nutrition. 15: 11. doi:10.1186/s12970-018-0216-0. PMC 5839013. PMID 29527137. ^ Warren GL, Park ND, Maresca RD, McKibans KI, Millard-Stafford ML (July 2010). "Effect of caffeine ingestion on muscular strength and endurance: a meta-analysis". Medicine and Science in Sports and Exercise. 42 (7): 1375–87. doi:10.1249/MSS.0b013e3181cabbd8. PMID 20019636. ^ Grgic J (March 2018). "Caffeine ingestion enhances Wingate performance: a meta-analysis". European Journal of Sport Science. 18 (2): 219–225. doi:10.1080/17461391.2017.1394371. PMID 29087785. ^ Doherty M, Smith PM (April 2005). "Effects of caffeine ingestion on rating of perceived exertion during and after exercise: a meta-analysis". Scandinavian Journal of Medicine & Science in Sports. 15 (2): 69–78. doi:10.1111/j.1600-0838.2005.00445.x. PMID 15773860. ^ Southward, K; Rutherfurd-Markwick, KJ; Ali, A (August 2018). "The Effect of Acute Caffeine Ingestion on Endurance Performance: A Systematic Review and Meta-Analysis". Sports medicine (Auckland, N.Z.). 48 (8): 1913–1928. doi:10.1007/s40279-018-0939-8. PMID 29876876. ^ Shen, JG; Brooks, MB; Cincotta, J; Manjourides, JD (February 2019). "Establishing a relationship between the effect of caffeine and duration of endurance athletic time trial events: A systematic review and meta-analysis". Journal of science and medicine in sport. 22 (2): 232–238. doi:10.1016/j.jsams.2018.07.022. PMID 30170953. ^ a b c d "It's Your Health – Caffeine". Health Canada. March 2010. Retrieved 8 November 2010. ^ Castellanos FX, Rapoport JL (2002). "Effects of caffeine on development and behavior in infancy and childhood: A review of the published literature". Food and Chemical Toxicology. 40 (9): 1235–1242. doi:10.1016/S0278-6915(02)00097-2. ^ Levounis P, Herron AJ (2014). The Addiction Casebook. American Psychiatric Pub. p. 49. ISBN 978-1-58562-458-4. ^ "Food Standards Agency publishes new caffeine advice for pregnant women". Retrieved 3 August 2009. ^ Kuczkowski KM (November 2009). "Caffeine in pregnancy". Archives of Gynecology and Obstetrics. 280 (5): 695–8. doi:10.1007/s00404-009-0991-6. PMID 19238414. ^ Brent RL, Christian MS, Diener RM (April 2011). "Evaluation of the reproductive and developmental risks of caffeine". Birth Defects Research. Part B, Developmental and Reproductive Toxicology. 92 (2): 152–87. doi:10.1002/bdrb.20288. PMC 3121964. PMID 21370398. ^ Chen LW, Wu Y, Neelakantan N, Chong MF, Pan A, van Dam RM (September 2014). "Maternal caffeine intake during pregnancy is associated with risk of low birth weight: a systematic review and dose-response meta-analysis". BMC Medicine. 12 (1): 174. doi:10.1186/s12916-014-0174-6. PMC 4198801. PMID 25238871. ^ Chen LW, Wu Y, Neelakantan N, Chong MF, Pan A, van Dam RM (May 2016). "Maternal caffeine intake during pregnancy and risk of pregnancy loss: a categorical and dose-response meta-analysis of prospective studies". Public Health Nutrition. 19 (7): 1233–44. doi:10.1017/S1368980015002463. PMID 26329421. ^ Lassi ZS, Imam AM, Dean SV, Bhutta ZA (September 2014). "Preconception care: caffeine, smoking, alcohol, drugs and other environmental chemical/radiation exposure". Reproductive Health. 11 Suppl 3: S6. doi:10.1186/1742-4755-11-S3-S6. PMC 4196566. PMID 25415846. ^ Daniels JW, Molé PA, Shaffrath JD, Stebbins CL (July 1998). "Effects of caffeine on blood pressure, heart rate, and forearm blood flow during dynamic leg exercise". Journal of Applied Physiology. 85 (1): 154–9. doi:10.1152/jappl.1998.85.1.154. PMID 9655769. ^ Bracco D, Ferrarra JM, Arnaud MJ, Jéquier E, Schutz Y (October 1995). "Effects of caffeine on energy metabolism, heart rate, and methylxanthine metabolism in lean and obese women". The American Journal of Physiology. 269 (4 Pt 1): E671–8. doi:10.1152/ajpendo.1995.269.4.E671. PMID 7485480. ^ Mahmud A, Feely J (August 2001). "Acute effect of caffeine on arterial stiffness and aortic pressure waveform". Hypertension. 38 (2): 227–31. doi:10.1161/01.HYP.38.2.227. PMID 11509481. ^ Boekema PJ, Samsom M, van Berge Henegouwen GP, Smout AJ (1999). "Coffee and gastrointestinal function: facts and fiction. A review". Scandinavian Journal of Gastroenterology. Supplement. 230 (230): 35–9. PMID 10499460. ^ Cohen S, Booth GH (October 1975). "Gastric acid secretion and lower-esophageal-sphincter pressure in response to coffee and caffeine". The New England Journal of Medicine. 293 (18): 897–9. doi:10.1056/NEJM197510302931803. PMID 1177987. ^ Sherwood L, Kell R (2009). Human Physiology: From Cells to Systems (1st Canadian ed.). Nelsen. pp. 613–9. ISBN 978-0-17-644107-4. ^ a b Welsh EJ, Bara A, Barley E, Cates CJ (January 2010). Welsh EJ (ed.). "Caffeine for asthma". The Cochrane Database of Systematic Reviews (1): CD001112. doi:10.1002/14651858.CD001112.pub2. PMID 20091514. ^ "Caffeine in the diet". MedlinePlus, US National Library of Medicine. 30 April 2013. Retrieved 2 January 2015. ^ Rapuri PB, Gallagher JC, Kinyamu HK, Ryschon KL (November 2001). "Caffeine intake increases the rate of bone loss in elderly women and interacts with vitamin D receptor genotypes". The American Journal of Clinical Nutrition. 74 (5): 694–700. doi:10.1093/ajcn/74.5.694. PMID 11684540. ^ a b Maughan RJ, Griffin J (December 2003). "Caffeine ingestion and fluid balance: a review". Journal of Human Nutrition and Dietetics. 16 (6): 411–20. doi:10.1046/j.1365-277X.2003.00477.x. PMID 19774754. ^ Anahad O'connor (4 March 2008). "Really? The claim: caffeine causes dehydration". New York Times. Retrieved 3 August 2009. ^ Armstrong LE, Casa DJ, Maresh CM, Ganio MS (July 2007). "Caffeine, fluid-electrolyte balance, temperature regulation, and exercise-heat tolerance". Exercise and Sport Sciences Reviews. 35 (3): 135–40. doi:10.1097/jes.0b013e3180a02cc1. PMID 17620932. ^ Tarnopolsky MA (2010). "Caffeine and creatine use in sport". Annals of Nutrition & Metabolism. 57 Suppl 2: 1–8. doi:10.1159/000322696. PMID 21346331. ^ Lara DR (2010). "Caffeine, mental health, and psychiatric disorders". Journal of Alzheimer's Disease. 20 Suppl 1: S239–48. doi:10.3233/JAD-2010-1378. PMID 20164571. ^ a b Wang L, Shen X, Wu Y, Zhang D (March 2016). "Coffee and caffeine consumption and depression: A meta-analysis of observational studies". The Australian and New Zealand Journal of Psychiatry. 50 (3): 228–42. doi:10.1177/0004867415603131. PMID 26339067. ^ a b Grosso G, Micek A, Castellano S, Pajak A, Galvano F (January 2016). "Coffee, tea, caffeine and risk of depression: A systematic review and dose-response meta-analysis of observational studies". Molecular Nutrition & Food Research. 60 (1): 223–34. doi:10.1002/mnfr.201500620. PMID 26518745. ^ Hrnčiarove J, Barteček R (2017). "8. Substance Dependence". In Hosák L, Hrdlička M, et al. (eds.). Psychiatry and Pedopsychiatry. Prague: Karolinum Press. pp. 153–154. ISBN 9788024633787. At a high dose, caffeine shows a euphoric effect. ^ Schulteis G (2010). "Brain stimulation and addiction". In Koob GF, Le Moal M, Thompson RF (eds.). Encyclopedia of Behavioral Neuroscience. Elsevier. p. 214. ISBN 978-0-08-091455-8. Therefore, caffeine and other adenosine antagonists, while weakly euphoria-like on their own, may potentiate the positive hedonic efficacy of acute drug intoxication and reduce the negative hedonic consequences of drug withdrawal. ^ Salerno BB, Knights EK (2010). Pharmacology for health professionals (3rd ed.). Chatswood, N.S.W. : Elsevier Australia. p. 433. ISBN 978-0-7295-3929-6. In contrast to the amphetamines, caffeine does not cause euphoria, stereotyped behaviors or psychoses. ^ Ebenezer I (2015). Neuropsychopharmacology and Therapeutics. John Wiley & Sons. p. 18. ISBN 978-1-118-38578-4. However, in contrast to other psychoactive stimulants, such as amphetamine and cocaine, caffeine and the other methylxanthines do not produce euphoria, stereotyped behaviors or psychotic like symptoms in large doses. ^ Rang HP, Ritter JM, Flower RJ, Henderson G (2014). Rang & Dale's Pharmacology E-Book (8th ed.). Elsevier Health Sciences. pp. 453, 594. ISBN 978-0-7020-5497-6. By comparison with amphetamines, methylxanthines produce less locomotor stimulation and do not induce euphoria, stereotyped behaviour patterns or a psychotic state, but their effects on fatigue and mental function are similar. Table 37.2 ... Psychomotor stimulants ... Drugs that cause wakefulness and euphoria ... Amphetamines, cocaine, methylphenidate, caffeine. ^ a b Addicott MA (September 2014). "Caffeine Use Disorder: A Review of the Evidence and Future Implications". Current Addiction Reports. 1 (3): 186–192. doi:10.1007/s40429-014-0024-9. PMC 4115451. PMID 25089257. ^ Nestler, Eric J.; Hymen E., Steven E.; Holtzmann, David M.; Malenka, Robert C. "16". Molecular Neuropharmacology: A Foundation for Clinical Neuroscience (3rd ed.). McGraw-Hill Education. True compulsive use of caffeine has not been documented, and, consequently, these drugs are not considered addictive. ^ Meredith SE, Juliano LM, Hughes JR, Griffiths RR (September 2013). "Caffeine Use Disorder: A Comprehensive Review and Research Agenda". Journal of Caffeine Research. 3 (3): 114–130. doi:10.1089/jcr.2013.0016. PMC 3777290. PMID 24761279. ^ Riba A, Tasman J, Kay JA, Lieberman MB, First MB (2014). Psychiatry (Fourth ed.). p. 1446. ISBN 978-1-118-75336-1. ^ Fishchman N, Mello N. Testing for Abuse Liability of Drugs in Humans (PDF). 5600 Fishers Lane Rockville, MD 20857: U.S. Department of Health and Human Services Public Health Service Alcohol, Drug Abuse, and Mental Health Administration National Institute on Drug Abuse. p. 179. Archived from the original (PDF) on 22 December 2016. ^ Miller PM (2013). "Chapter III: Types of Addiction". Principles of addiction comprehensive addictive behaviors and disorders (1st ed.). Elsevier Academic Press. p. 784. ISBN 978-0-12-398361-9. Retrieved 11 July 2015. Astrid Nehlig and colleagues present evidence that in animals caffeine does not trigger metabolic increases or dopamine release in brain areas involved in reinforcement and reward. A single photon emission computed tomography (SPECT) assessment of brain activation in humans showed that caffeine activates regions involved in the control of vigilance, anxiety, and cardiovascular regulation but did not affect areas involved in reinforcement and reward. ^ Temple JL (June 2009). "Caffeine use in children: what we know, what we have left to learn, and why we should worry". Neuroscience and Biobehavioral Reviews. 33 (6): 793–806. doi:10.1016/j.neubiorev.2009.01.001. PMC 2699625. PMID 19428492. Through these interactions, caffeine is able to directly potentiate dopamine neurotransmission, thereby modulating the rewarding and addicting properties of nervous system stimuli. ^ a b "ICD-10 Version:2015". World Health Organization. 2015. Retrieved 10 July 2015. A cluster of behavioural, cognitive, and physiological phenomena that develop after repeated substance use and that typically include a strong desire to take the drug, difficulties in controlling its use, persisting in its use despite harmful consequences, a higher priority given to drug use than to other activities and obligations, increased tolerance, and sometimes a physical withdrawal state. ^ Association American Psychiatry (2013). Diagnostic and statistical manual of mental disorders : DSM-5 (5th ed.). Washington [etc. ]: American Psychiatric Publishing. pp. 792–795. ISBN 978-0-89042-555-8. ^ a b Temple JL (June 2009). "Caffeine use in children: what we know, what we have left to learn, and why we should worry". Neuroscience and Biobehavioral Reviews. 33 (6): 793–806. doi:10.1016/j.neubiorev.2009.01.001. PMC 2699625. PMID 19428492. ^ "Information about caffeine dependence". Caffeinedependence.org. Johns Hopkins Medicine. 9 July 2003. Archived from the original on 23 May 2012. Retrieved 25 May 2012. ^ a b c d e Fredholm BB, Bättig K, Holmén J, Nehlig A, Zvartau EE (March 1999). "Actions of caffeine in the brain with special reference to factors that contribute to its widespread use". Pharmacological Reviews. 51 (1): 83–133. PMID 10049999. ^ Santos C, Costa J, Santos J, Vaz-Carneiro A, Lunet N (2010). "Caffeine intake and dementia: systematic review and meta-analysis". Journal of Alzheimer's Disease. 20 Suppl 1: S187–204. doi:10.3233/JAD-2010-091387. PMID 20182026. ^ Panza F, Solfrizzi V, Barulli MR, Bonfiglio C, Guerra V, Osella A, Seripa D, Sabbà C, Pilotto A, Logroscino G (March 2015). "Coffee, tea, and caffeine consumption and prevention of late-life cognitive decline and dementia: a systematic review". The Journal of Nutrition, Health & Aging. 19 (3): 313–28. doi:10.1007/s12603-014-0563-8. PMID 25732217. ^ Muriel P, Arauz J (July 2010). "Coffee and liver diseases". Fitoterapia. 81 (5): 297–305. doi:10.1016/j.fitote.2009.10.003. PMID 19825397. ^ Hackett PH (2010). "Caffeine at high altitude: java at base cAMP". High Altitude Medicine & Biology. 11 (1): 13–7. doi:10.1089/ham.2009.1077. PMID 20367483. ^ Jiang X, Zhang D, Jiang W (February 2014). "Coffee and caffeine intake and incidence of type 2 diabetes mellitus: a meta-analysis of prospective studies". European Journal of Nutrition. 53 (1): 25–38. doi:10.1007/s00394-013-0603-x. PMID 24150256. Dose-response analysis suggested that incidence of T2DM decreased ...14% [0.86 (0.82-0.91)] for every 200 mg/day increment in caffeine intake. ^ Liu R, Guo X, Park Y, Huang X, Sinha R, Freedman ND, Hollenbeck AR, Blair A, Chen H (June 2012). "Caffeine intake, smoking, and risk of Parkinson disease in men and women". American Journal of Epidemiology. 175 (11): 1200–7. doi:10.1093/aje/kwr451. PMC 3370885. PMID 22505763. ^ Li M, Wang M, Guo W, Wang J, Sun X (March 2011). "The effect of caffeine on intraocular pressure: a systematic review and meta-analysis". Graefe's Archive for Clinical and Experimental Ophthalmology = Albrecht von Graefes Archiv Fur Klinische und Experimentelle Ophthalmologie. 249 (3): 435–42. doi:10.1007/s00417-010-1455-1. PMID 20706731. ^ a b c "Caffeine (Systemic)". MedlinePlus. 25 May 2000. Archived from the original on 23 February 2007. Retrieved 3 August 2009. ^ Winston AP, Hardwick E, Jaberi N (2005). "Neuropsychiatric effects of caffeine". Advances in Psychiatric Treatment. 11 (6): 432–439. doi:10.1192/apt.11.6.432. Retrieved 19 December 2013. ^ Iancu I, Olmer A, Strous RD (2007). "Caffeinism: History, clinical features, diagnosis, and treatment". In Smith BD, Gupta U, Gupta BS (eds.). Caffeine and Activation Theory: Effects on Health and Behavior. CRC Press. pp. 331–344. ISBN 978-0-8493-7102-8. Retrieved 15 January 2014. ^ American Psychiatric Association (1994). Diagnostic and Statistical Manual of Mental Disorders (4th ed.). American Psychiatric Association. ISBN 978-0-89042-062-1. ^ "Caffeine overdose". MedlinePlus. 4 April 2006. Retrieved 3 August 2009. ^ Verkhratsky A (January 2005). "Physiology and pathophysiology of the calcium store in the endoplasmic reticulum of neurons". Physiological Reviews. 85 (1): 201–79. doi:10.1152/physrev.00004.2004. PMID 15618481. ^ Holmgren P, Nordén-Pettersson L, Ahlner J (January 2004). "Caffeine fatalities--four case reports". Forensic Science International. 139 (1): 71–3. doi:10.1016/j.forsciint.2003.09.019. PMID 14687776. ^ "FDA Consumer Advice on Powdered Pure Caffeine". FDA. Retrieved 20 August 2014. ^ Peters JM (1967). "Factors Affecting Caffeine Toxicity: A Review of the Literature". The Journal of Clinical Pharmacology and the Journal of New Drugs. 7 (3): 131–141. doi:10.1002/j.1552-4604.1967.tb00034.x. Archived from the original on 12 January 2012. ^ Murray Carpenter. "Caffeine powder poses deadly risks". New York Times. Retrieved 18 May 2015. ^ Rodopoulos N, Wisén O, Norman A (May 1995). "Caffeine metabolism in patients with chronic liver disease". Scandinavian Journal of Clinical and Laboratory Investigation. 55 (3): 229–42. doi:10.3109/00365519509089618. PMID 7638557. ^ Cheston P, Smith L (11 October 2013). "Man died after overdosing on caffeine mints". The Independent. Retrieved 13 October 2013. ^ Prynne M (11 October 2013). "Warning over caffeine sweets after father dies from overdose". The Telegraph. Retrieved 13 October 2013. ^ Fricker M (12 October 2013). "John Jackson: Family of dad who died from caffeine overdose after eating MINTS want them removed from sale". Daily Mirror. Retrieved 13 October 2013. ^ "Caffeine Drug Monographs". UpToDate. Retrieved 28 November 2018. ^ Mackay M, Tiplady B, Scholey AB (April 2002). "Interactions between alcohol and caffeine in relation to psychomotor speed and accuracy". Human Psychopharmacology. 17 (3): 151–6. doi:10.1002/hup.371. PMID 12404692. ^ a b c Liguori A, Robinson JH (July 2001). "Caffeine antagonism of alcohol-induced driving impairment". Drug and Alcohol Dependence. 63 (2): 123–9. doi:10.1016/s0376-8716(00)00196-4. PMID 11376916. ^ Marczinski CA, Fillmore MT (August 2003). "Dissociative antagonistic effects of caffeine on alcohol-induced impairment of behavioral control". Experimental and Clinical Psychopharmacology. 11 (3): 228–36. doi:10.1037/1064-1297.11.3.228. PMID 12940502. ^ Zevin S, Benowitz NL (June 1999). "Drug interactions with tobacco smoking. An update". Clinical Pharmacokinetics. 36 (6): 425–38. doi:10.2165/00003088-199936060-00004. PMID 10427467. ^ Benowitz NL (1990). "Clinical pharmacology of caffeine". Annual Review of Medicine. 41: 277–88. doi:10.1146/annurev.me.41.020190.001425. PMID 2184730. ^ Gilmore B, Michael M (February 2011). "Treatment of acute migraine headache". American Family Physician. 83 (3): 271–80. PMID 21302868. ^ Benzon, Honorio. Practical management of pain (Fifth ed.). pp. 508–529. ISBN 978-0-323-08340-9. ^ "Vitamin B4". R&S Pharmchem. April 2011. Archived from the original on 15 July 2011. ^ a b c Froestl W, Muhs A, Pfeifer A (2012). "Cognitive enhancers (nootropics). Part 1: drugs interacting with receptors". Journal of Alzheimer's Disease. 32 (4): 793–887. doi:10.3233/JAD-2012-121186. PMID 22886028. ^ "World of Caffeine". World of Caffeine. 15 June 2013. Retrieved 19 December 2013. ^ Fisone G, Borgkvist A, Usiello A (April 2004). "Caffeine as a psychomotor stimulant: mechanism of action". Cellular and Molecular Life Sciences. 61 (7–8): 857–72. doi:10.1007/s00018-003-3269-3. PMID 15095008. ^ "Caffeine". IUPHAR. International Union of Basic and Clinical Pharmacology. Retrieved 2 November 2014. ^ Duan L, Yang J, Slaughter MM (August 2009). "Caffeine inhibition of ionotropic glycine receptors". The Journal of Physiology. 587 (Pt 16): 4063–75. doi:10.1113/jphysiol.2009.174797. PMC 2756438. PMID 19564396. ^ a b c Ferré S (2010). "Role of the central ascending neurotransmitter systems in the psychostimulant effects of caffeine". Journal of Alzheimer's Disease. 20 Suppl 1: S35–49. doi:10.3233/JAD-2010-1400. PMID 20182056. By targeting A1-A2A receptor heteromers in striatal glutamatergic terminals and A1 receptors in striatal dopaminergic terminals (presynaptic brake), caffeine induces glutamate-dependent and glutamate-independent release of dopamine. These presynaptic effects of caffeine are potentiated by the release of the postsynaptic brake imposed by antagonistic interactions in the striatal A2A-D2 and A1-D1 receptor heteromers. ^ a b Ferré S, Bonaventura J, Tomasi D, Navarro G, Moreno E, Cortés A, Lluís C, Casadó V, Volkow ND (May 2016). "Allosteric mechanisms within the adenosine A2A-dopamine D2 receptor heterotetramer". Neuropharmacology. 104: 154–60. doi:10.1016/j.neuropharm.2015.05.028. PMC 5754196. PMID 26051403. ^ a b Bonaventura J, Navarro G, Casadó-Anguera V, Azdad K, Rea W, Moreno E, Brugarolas M, Mallol J, Canela EI, Lluís C, Cortés A, Volkow ND, Schiffmann SN, Ferré S, Casadó V (July 2015). "Allosteric interactions between agonists and antagonists within the adenosine A2A receptor-dopamine D2 receptor heterotetramer". Proceedings of the National Academy of Sciences of the United States of America. 112 (27): E3609–18. Bibcode:2015PNAS..112E3609B. doi:10.1073/pnas.1507704112. PMC 4500251. PMID 26100888. Adenosine A2A receptor (A2AR)-dopamine D2 receptor (D2R) heteromers are key modulators of striatal neuronal function. It has been suggested that the psychostimulant effects of caffeine depend on its ability to block an allosteric modulation within the A2AR-D2R heteromer, by which adenosine decreases the affinity and intrinsic efficacy of dopamine at the D2R. ^ a b Ferré S (May 2016). "Mechanisms of the psychostimulant effects of caffeine: implications for substance use disorders". Psychopharmacology. 233 (10): 1963–79. doi:10.1007/s00213-016-4212-2. PMC 4846529. PMID 26786412. The striatal A2A-D2 receptor heteromer constitutes an unequivocal main pharmacological target of caffeine and provides the main mechanisms by which caffeine potentiates the acute and long-term effects of prototypical psychostimulants. ^ a b c d Ferré S (2008). "An update on the mechanisms of the psychostimulant effects of caffeine". J. Neurochem. 105 (4): 1067–1079. doi:10.1111/j.1471-4159.2007.05196.x. PMID 18088379. On the other hand, our 'ventral shell of the nucleus accumbens' very much overlaps with the striatal compartment simply described by De Luca et al. (2007) as 'nucleus accumbens shell,' where both studies show that caffeine does not modify the extracellular levels of dopamine. Therefore, the results of both experimental groups are basically the same and point to differential effects of caffeine in different striatal subcompartments. In fact, analyzing the effects of the intrastriatal perfusion of an A1 receptor antagonist in several other striatal compartments showed striking differences compared with the shell of the nucleus accumbens. Thus, A1 receptor blockade significantly increased the extracellular concentration of dopamine, but not glutamate, in the core of the nucleus accumbens and in the caudate–putamen and the effect was more pronounced in the most medial compartments (Boryczet al. 2007). In summary, a subregional difference in the A1 receptor-mediated control of glutamate and dopamine release exists in the striatum ... A2A receptors play a crucial role in the sleep-promoting effects of adenosine and the arousal-enhancing effects of caffeine (Huang et al. 2007; Ferré et al. 2007a). Those A2A receptors are localized in the ventrolateral pre-optic area of the hypothalamus and their stimulation promotes sleep by inducing GABA release in the histaminergic tuberomammillary nucleus, thereby inhibiting the histaminergic arousal system ... chronic caffeine exposure counteracts both motor activation and dopamine release in the nucleus accumbens induced by caffeine or an A1 receptor antagonist ... An additional factor that might play a significant role in caffeine tolerance is the significant increase in plasma and extracellular concentrations of adenosine with chronic caffeine exposure ... The existence of an A1 receptor-mediated glutamate-independent modulation of dopamine release suggested the presence of functional A1 receptors in striatal dopaminergic terminals. ... In the SSM, adenosine acts pre- and post-synaptically through multiple mechanisms, which depend on heteromerization of A1 and A2A receptors among themselves and with D1 and D2 receptors, respectively. Caffeine produces its motor and reinforcing effects by releasing the pre- and post-synaptic brakes that adenosine imposes on dopaminergic neurotransmission in the SSM. By releasing the pre-synaptic brake, caffeine induces glutamate-dependent and glutamate-independent release of dopamine. ^ Ribeiro JA, Sebastião AM (2010). "Caffeine and adenosine". Journal of Alzheimer's Disease. 20 Suppl 1: S3–15. doi:10.3233/JAD-2010-1379. PMID 20164566. ^ Essayan DM (November 2001). "Cyclic nucleotide phosphodiesterases". The Journal of Allergy and Clinical Immunology. 108 (5): 671–80. doi:10.1067/mai.2001.119555. PMID 11692087. ^ Deree J, Martins JO, Melbostad H, Loomis WH, Coimbra R (June 2008). "Insights into the regulation of TNF-alpha production in human mononuclear cells: the effects of non-specific phosphodiesterase inhibition". Clinics. 63 (3): 321–8. doi:10.1590/S1807-59322008000300006. PMC 2664230. PMID 18568240. ^ Marques LJ, Zheng L, Poulakis N, Guzman J, Costabel U (February 1999). "Pentoxifylline inhibits TNF-alpha production from human alveolar macrophages". American Journal of Respiratory and Critical Care Medicine. 159 (2): 508–11. doi:10.1164/ajrccm.159.2.9804085. PMID 9927365. ^ a b Peters-Golden M, Canetti C, Mancuso P, Coffey MJ (January 2005). "Leukotrienes: underappreciated mediators of innate immune responses". Journal of Immunology. 174 (2): 589–94. doi:10.4049/jimmunol.174.2.589. PMID 15634873. ^ a b Arnaud, Maurice J. (19 August 2010). Pharmacokinetics and metabolism of natural methylxanthines in animal and man. Handbook of Experimental Pharmacology. 200. pp. 33–91. doi:10.1007/978-3-642-13443-2_3. ISBN 978-3-642-13442-5. PMID 20859793. ^ Liguori A, Hughes JR, Grass JA (November 1997). "Absorption and subjective effects of caffeine from coffee, cola and capsules". Pharmacology Biochemistry and Behavior. 58 (3): 721–6. doi:10.1016/S0091-3057(97)00003-8. PMID 9329065. ^ Blanchard, J.; Sawers, S. J. A. (1983). "The absolute bioavailability of caffeine in man". European Journal of Clinical Pharmacology. 24 (1): 93–98. doi:10.1007/bf00613933. ISSN 0031-6970. ^ Newton R, Broughton LJ, Lind MJ, Morrison PJ, Rogers HJ, Bradbrook ID (1981). "Plasma and salivary pharmacokinetics of caffeine in man". European Journal of Clinical Pharmacology. 21 (1): 45–52. doi:10.1007/BF00609587. PMID 7333346. ^ Graham JR (June 1954). "Rectal use of ergotamine tartrate and caffeine alkaloid for the relief of migraine". The New England Journal of Medicine. 250 (22): 936–8. doi:10.1056/NEJM195406032502203. PMID 13165929. ^ Brødbaek HB, Damkier P (May 2007). "[The treatment of hyperemesis gravidarum with chlorobutanol-caffeine rectal suppositories in Denmark: practice and evidence]". Ugeskrift for Laeger (in Danish). 169 (22): 2122–3. PMID 17553397. ^ Teekachunhatean S, Tosri N, Rojanasthien N, Srichairatanakool S, Sangdee C (8 January 2013). "Pharmacokinetics of Caffeine following a Single Administration of Coffee Enema versus Oral Coffee Consumption in Healthy Male Subjects". ISRN Pharmacology. 2013 (147238): 1–7. doi:10.1155/2013/147238. PMC 3603218. PMID 23533801. ^ "Drug Interaction: Caffeine Oral and Fluvoxamine Oral". Medscape Multi-Drug Interaction Checker. ^ "Caffeine". The Pharmacogenetics and Pharmacogenomics Knowledge Base. Retrieved 25 October 2010. ^ Verbeeck RK (December 2008). "Pharmacokinetics and dosage adjustment in patients with hepatic dysfunction". European Journal of Clinical Pharmacology. 64 (12): 1147–61. doi:10.1007/s00228-008-0553-z. PMID 18762933. ^ Cornelis MC, Monda KL, Yu K, Paynter N, Azzato EM, Bennett SN, Berndt SI, Boerwinkle E, Chanock S, Chatterjee N, Couper D, Curhan G, Heiss G, Hu FB, Hunter DJ, Jacobs K, Jensen MK, Kraft P, Landi MT, Nettleton JA, Purdue MP, Rajaraman P, Rimm EB, Rose LM, Rothman N, Silverman D, Stolzenberg-Solomon R, Subar A, Yeager M, Chasman DI, van Dam RM, Caporaso NE (April 2011). Gibson G (ed.). "Genome-wide meta-analysis identifies regions on 7p21 (AHR) and 15q24 (CYP1A2) as determinants of habitual caffeine consumption". PLoS Genetics. 7 (4): e1002033. doi:10.1371/journal.pgen.1002033. PMC 3071630. PMID 21490707. ^ a b Susan Budavari, ed. (1996). The Merck Index (12th ed.). Whitehouse Station, NJ: Merck & Co., Inc. p. 1674. ^ This is the pKa for protonated caffeine, given as a range of values included in Brittain HG, Prankerd RJ (2007). Profiles of Drug Substances, Excipients and Related Methodology, volume 33: Critical Compilation of pKa Values for Pharmaceutical Substances. Academic Press. p. 15. ISBN 978-0-12-260833-9. Retrieved 15 January 2014. ^ Klosterman L (2006). The Facts About Caffeine (Drugs). Benchmark Books (NY). p. 43. ISBN 978-0-7614-2242-6. ^ Vallombroso T (2001). Organic Chemistry Pearls of Wisdom. Boston Medical Publishing Corp. p. 43. ISBN 978-1-58409-016-8. ^ Keskineva N. "Chemistry of Caffeine" (PDF). Chemistry Department, East Stroudsburg University. Archived from the original (PDF) on 2 January 2014. Retrieved 2 January 2014. ^ "Caffeine biosynthesis". The Enzyme Database. Trinity College Dublin. Retrieved 24 September 2011. ^ "MetaCyc Pathway: caffeine biosynthesis I". MetaCyc database. SRI International. Retrieved 12 July 2017. ^ a b Temple NJ, Wilson T (2003). Beverages in Nutrition and Health. Totowa, NJ: Humana Press. p. 172. ISBN 978-1-58829-173-8. ^ a b ‹See Tfd›US patent 2785162, ‹See Tfd›Swidinsky J, Baizer MM, "Process for the formylation of a 5-nitrouracil", published 12 March 1957, assigned to New York Quinine and Chemical Works, Inc.
^ Denoeud F, Carretero-Paulet L, Dereeper A, Droc G, Guyot R, Pietrella M, et al. (September 2014). "The coffee genome provides insight into the convergent evolution of caffeine biosynthesis". Science. 345 (6201): 1181–4. Bibcode:2014Sci...345.1181D. doi:10.1126/science.1255274. PMID 25190796. ^ Huang R, O'Donnell AJ, Barboline JJ, Barkman TJ (September 2016). "Convergent evolution of caffeine in plants by co-option of exapted ancestral enzymes". Proceedings of the National Academy of Sciences of the United States of America. 113 (38): 10613–8. doi:10.1073/pnas.1602575113. PMC 5035902. PMID 27638206. ^ Williams R (21 September 2016). "How Plants Evolved Different Ways to Make Caffeine". ^ Zajac MA, Zakrzewski AG, Kowal MG, Narayan S (2003). "A Novel Method of Caffeine Synthesis from Uracil" (PDF). Synthetic Communications. 33 (19): 3291–3297. doi:10.1081/SCC-120023986. ^ Simon Tilling. "Crystalline Caffeine". Bristol University. Retrieved 3 August 2009. ^ a b c Senese F (20 September 2005). "How is coffee decaffeinated?". General Chemistry Online. Retrieved 3 August 2009. ^ McCusker RR, Fuehrlein B, Goldberger BA, Gold MS, Cone EJ (October 2006). "Caffeine content of decaffeinated coffee". Journal of Analytical Toxicology. 30 (8): 611–3. doi:10.1093/jat/30.8.611. PMID 17132260. Lay summary – University of Florida News. ^ Baselt R (2017). Disposition of Toxic Drugs and Chemicals in Man (11th ed.). Seal Beach, CA: Biomedical Publications. pp. 335–8. ISBN 978-0-692-77499-1. ^ Seale TW, Abla KA, Shamim MT, Carney JM, Daly JW (1988). "3,7-Dimethyl-1-propargylxanthine: a potent and selective in vivo antagonist of adenosine analogs". Life Sciences. 43 (21): 1671–84. doi:10.1016/0024-3205(88)90478-x. PMID 3193854. ^ Kennerly J (22 September 1995). "N Substituted Xanthines: A Caffeine Analog Information File". Retrieved 6 November 2015. ^ Müller, Christa E.; Jacobson, Kenneth A. (19 August 2010). Fredholm, Bertil B. (ed.). "Xanthines as adenosine receptor antagonists". Handbook of Experimental Pharmacology. 200 (200): 151–99. doi:10.1007/978-3-642-13443-2_6. PMC 3882893. PMID 20859796. ^ "Which Plants Contain Caffeine?". medscape.com. ^ For more information, see Alejandro Lopez-Ortiz. "Frequently Asked Questions about Coffee and Caffeine". ^ Nathanson JA (October 1984). "Caffeine and related methylxanthines: possible naturally occurring pesticides". Science. 226 (4671): 184–7. Bibcode:1984Sci...226..184N. doi:10.1126/science.6207592. PMID 6207592. ^ Frischknecht PM, Ulmer-Dufek J, Baumann TW (1986). "Purine alkaloid formation in buds and developing leaflets of Coffea arabica: Expression of an optimal defence strategy?". Phytochemistry. 25 (3): 613–6. doi:10.1016/0031-9422(86)88009-8. ^ Baumann TW (1984). "Metabolism and excretion of caffeine during germination of Coffea arabica L". Plant and Cell Physiology. 25 (8): 1431–6. ^ van Breda SV, van der Merwe CF, Robbertse H, Apostolides Z (March 2013). "Immunohistochemical localization of caffeine in young Camellia sinensis (L.) O. Kuntze (tea) leaves". Planta. 237 (3): 849–58. doi:10.1007/s00425-012-1804-x. hdl:2263/20662. PMID 23143222. ^ a b Wright GA, Baker DD, Palmer MJ, Stabler D, Mustard JA, Power EF, Borland AM, Stevenson PC (March 2013). "Caffeine in floral nectar enhances a pollinator's memory of reward". Science. 339 (6124): 1202–4. Bibcode:2013Sci...339.1202W. doi:10.1126/science.1228806. PMC 4521368. PMID 23471406. ^ "Caffeine Content of Food and Drugs". Nutrition Action Health Newsletter. Center for Science in the Public Interest. 1996. Archived from the original on 14 June 2007. Retrieved 3 August 2009. ^ a b "Caffeine Content of Beverages, Foods, & Medications". The Vaults of Erowid. 7 July 2006. Retrieved 3 August 2009. ^ "Caffeine Content of Drinks". Caffeine Informer. Retrieved 8 December 2013. ^ a b Chin JM, Merves ML, Goldberger BA, Sampson-Cone A, Cone EJ (October 2008). "Caffeine content of brewed teas". Journal of Analytical Toxicology. 32 (8): 702–4. doi:10.1093/jat/32.8.702. PMID 19007524. ^ a b Richardson B (2009). "Too Easy to be True. De-bunking the At-Home Decaffeination Myth". Elmwood Inn. Archived from the original on 27 December 2011. Retrieved 12 January 2012. ^ "Traditional Yerba Mate in Biodegradable Bag". Guayaki Yerba Mate. Archived from the original on 29 June 2014. Retrieved 17 July 2010. ^ Matissek R (1997). "Evaluation of xanthine derivatives in chocolate: nutritional and chemical aspects". European Food Research and Technology. 205 (3): 175–84. doi:10.1007/s002170050148. INIST:2861730. ^ a b "Caffeine". International Coffee Organization. Archived from the original on 27 March 2009. Retrieved 1 August 2009. ^ a b "Coffee and Caffeine FAQ: Does dark roast coffee have less caffeine than light roast?". Retrieved 2 August 2009. ^ a b "All About Coffee: Caffeine Level". Jeremiah's Pick Coffee Co. Archived from the original on 18 March 2008. Retrieved 3 August 2009. ^ a b Hicks MB, Hsieh YH, Bell LN (1996). "Tea preparation and its influence on methylxanthine concentration". Food Research International. 29 (3–4): 325–330. doi:10.1016/0963-9969(96)00038-5. ^ "Nutrition and healthy eating". Mayo Clinic. Retrieved 18 November 2015. ^ Bempong DK, Houghton PJ, Steadman K (1993). "The xanthine content of guarana and its preparations". Int J Pharmacog. 31 (3): 175–181. doi:10.3109/13880209309082937. ISSN 0925-1618. ^ Martinez-Carter, Karina (9 April 2012). "Drinking mate in Buenos Aires". BBC. Retrieved 23 February 2019. ^ Rätsch, Christian (2005). The Encyclopedia of Psychoactive Plants: Ethnopharmacology and Its Applications. Simon and Schuster. p. PT1235. ISBN 9781594776625. ^ Smit HJ, Gaffan EA, Rogers PJ (November 2004). "Methylxanthines are the psycho-pharmacologically active constituents of chocolate". Psychopharmacology. 176 (3–4): 412–9. doi:10.1007/s00213-004-1898-3. PMID 15549276. ^ Weinberg BA, Bealer BK (2001). The World of caffeine: The Science and Culture of the World's Most Popular Drug. Routledge. p. 195. ISBN 978-0-415-92723-9. Retrieved 15 January 2014. ^ "LeBron James Shills for Sheets Caffeine Strips, a Bad Idea for Teens, Experts Say". Abcnews.go.com. ABC News. 10 June 2011. Retrieved 25 May 2012. ^ Nancy Shute (15 April 2007). "Over The Limit:Americans young and old crave high-octane fuel, and doctors are jittery". US News and World Reports. Archived from the original on 8 January 2014. ^ "F.D.A. Inquiry Leads Wrigley to Halt 'Energy Gum' Sales". New York Times. Associated Press. 8 May 2013. Retrieved 9 May 2013. ^ "Some Common Questions". Eagle Energy. Retrieved 22 May 2017. ^ "2012 – Breathable Foods, Inc. 3/5/12". www.fda.gov. Retrieved 22 May 2017. ^ "Food Additives & Ingredients > Caffeinated Alcoholic Beverages". fda.gov. Food and Drug Administration. 17 November 2010. Retrieved 24 January 2014. ^ Evans JC (1992). Tea in China: The History of China's National Drink. Greenwood Press. p. 2. ISBN 978-0-313-28049-8. ^ Weinberg BA, Bealer BK (2001). The World of Caffeine: The Science and Culture of the World's Most Popular Drug. Routledge. pp. 3–4. ISBN 978-0-415-92723-9. ^ Meyers H (7 March 2005). ""Suave Molecules of Mocha" – Coffee, Chemistry, and Civilization". New Partisan. Archived from the original on 9 March 2005. Retrieved 3 February 2007. ^ a b Fairbanks CH (2004). "The function of black drink among the Creeks". In Hudson MC (ed.). Black Drink. University of Georgia Press. p. 123. ISBN 978-0-8203-2696-2. ^ Crown PL, Emerson TE, Gu J, Hurst WJ, Pauketat TR, Ward T (August 2012). "Ritual Black Drink consumption at Cahokia". Proceedings of the National Academy of Sciences of the United States of America. 109 (35): 13944–9. Bibcode:2012PNAS..10913944C. doi:10.1073/pnas.1208404109. PMC 3435207. PMID 22869743. ^ Runge FF (1820). Neueste phytochemische Entdeckungen zur Begründung einer wissenschaftlichen Phytochemie [Latest phytochemical discoveries for the founding of a scientific phytochemistry]. Berlin: G. Reimer. pp. 144–159. Retrieved 8 January 2014. ^ Weinberg BA, Bealer BK (2001). The World of Caffeine: The Science and Culture of the World's Most Popular Drug. Routledge. pp. xvii–xxi. ISBN 978-0-415-92723-9. ^ Pelletier, Pierre Joseph (1822). "Cafeine". Dictionnaire de Médecine (in French). 4. Paris: Béchet Jeune. pp. 35–36. Retrieved 3 March 2011. ^ Robiquet, Pierre Jean (1823). "Café". Dictionnaire Technologique, ou Nouveau Dictionnaire Universel des Arts et Métiers (in French). 4. Paris: Thomine et Fortic. pp. 50–61. Retrieved 3 March 2011. ^ Dumas; Pelletier (1823). "Recherches sur la composition élémentaire et sur quelques propriétés caractéristiques des bases salifiables organiques" [Studies into the elemental composition and some characteristic properties of organic bases]. Annales de Chimie et de Physique (in French). 24: 163–191. ^ Oudry M (1827). "Note sur la Théine". Nouvelle Bibliothèque Médicale (in French). 1: 477–479. ^ Mulder, G. J. (1838). "Ueber Theïn und Caffeïn" [Concerning theine and caffeine]. Journal für Praktische Chemie. 15: 280–284. doi:10.1002/prac.18380150124. ^ Jobst, Carl (1838). "Thein identisch mit Caffein" [Theine is identical to caffeine]. Liebig's Annalen der Chemie und Pharmacie. 25: 63–66. doi:10.1002/jlac.18380250106. ^ Fischer began his studies of caffeine in 1881; however, understanding of the molecule's structure long eluded him. In 1895 he synthesized caffeine, but only in 1897 did he finally fully determine its molecular structure. Fischer E (1881). "Ueber das Caffeïn" [On caffeine]. Berichte der Deutschen Chemischen Gesellschaft zu Berlin (in German). 14: 637–644. doi:10.1002/cber.188101401142. Fischer E (1881). "Ueber das Caffeïn. Zweite Mitteilung" [On caffeine. Second communication.]. Berichte der Deutschen Chemischen Gesellschaft zu Berlin (in German). 14 (2): 1905–1915. doi:10.1002/cber.18810140283. Fischer E (1882). "Ueber das Caffeïn. Dritte Mitteilung" [On caffeine. Third communication.]. Berichte der Deutschen Chemischen Gesellschaft zu Berlin (in German). 15: 29–33. doi:10.1002/cber.18820150108. Fischer E, Ach L (1895). "Synthese des Caffeïns" [Synthesis of caffeine]. Berichte der Deutschen Chemischen Gesellschaft zu Berlin (in German). 28 (3): 3135–3143. doi:10.1002/cber.189502803156. Fischer E (1897). "Ueber die Constitution des Caffeïns, Xanthins, Hypoxanthins und verwandter Basen" [On the constitution of caffeine, xanthin, hypoxanthin, and related bases.]. Berichte der Deutschen Chemischen Gesellschaft zu Berlin (in German). 30: 549–559. doi:10.1002/cber.189703001110. ^ Hj. Théel (1902). "Nobel Prize Presentation Speech". Retrieved 3 August 2009. ^ Brown DW (2004). A new introduction to Islam. Chichester, West Sussex: Wiley-Blackwell. pp. 149–51. ISBN 978-1-4051-5807-7. ^ Ágoston, Gábor; Masters, Bruce (2009). Encyclopedia of the Ottoman Empire. p. 138. ^ Hopkins K (24 March 2006). "Food Stories: The Sultan's Coffee Prohibition". Accidental Hedonist. Archived from the original on 20 November 2012. Retrieved 3 January 2010. ^ "By the King. A PROCLAMATION FOR THE Suppression of Coffee-Houses". Retrieved 18 March 2012. ^ Benjamin LT, Rogers AM, Rosenbaum A (January 1991). "Coca-Cola, caffeine, and mental deficiency: Harry Hollingworth and the Chattanooga trial of 1911". Journal of the History of the Behavioral Sciences. 27 (1): 42–55. doi:10.1002/1520-6696(199101)27:1<42::AID-JHBS2300270105>3.0.CO;2-1. PMID 2010614. ^ "The Rise and Fall of Cocaine Cola". Lewrockwell.com. Retrieved 25 May 2012. ^ "CFR – Code of Federal Regulations Title 21". U.S. Food and Drug Administration. 21 August 2015. Retrieved 23 November 2015. ^ Sanner A (19 July 2014). "Sudden death of Ohio teen highlights dangers of caffeine powder". The Globe and Mail. Columbus, Ohio: Phillip Crawley. The Associated Press. Retrieved 23 November 2015. ^ Reissig CJ, Strain EC, Griffiths RR (January 2009). "Caffeinated energy drinks – a growing problem". Drug and Alcohol Dependence. 99 (1–3): 1–10. doi:10.1016/j.drugalcdep.2008.08.001. PMC 2735818. PMID 18809264. Lay summary – ScienceDaily (25 September 2008). ^ Geoffrey Burchfield (1997). Meredith Hopes (ed.). "What's your poison: caffeine". Australian Broadcasting Corporation. Archived from the original on 26 July 2009. Retrieved 15 January 2014. ^ Robinette, G. W. The War on Coffee. 1. p. 22. ISBN 978-0-9820787-6-1 – via Google Books. ^ "Mormonism in the News: Getting It Right August 29". The Church of Jesus Christ of Latter-Day Saints. 2012. Retrieved 17 April 2016. ^ "If Krishna does not accept my Chocolates, Who should I offer them to?". Dandavats.com. Retrieved 19 April 2018. ^ Buxton, Julia (17 December 2010). The Politics of Narcotic Drugs: A Survey. p. 189. ISBN 978-1857437591. ^ Juan Eduardo Campo (1 January 2009). Encyclopedia of Islam. Infobase Publishing. p. 154. ISBN 978-1-4381-2696-8. Retrieved 1 November 2012. ^ Daniel W. Brown (24 August 2011). A New Introduction to Islam. John Wiley & Sons. p. 149. ISBN 978-1-4443-5772-1. ^ "Newly Discovered Bacteria Lives on Caffeine". Blogs.scientificamerican.com. 24 May 2011. Retrieved 19 December 2013. ^ Paul L. "Why Caffeine is Toxic to Birds". HotSpot for Birds. Advin Systems. Archived from the original on 4 October 2011. Retrieved 29 February 2012. ^ "Caffeine". Retrieved 12 September 2014. ^ Noever R, Cronise J, Relwani RA (29 April 1995). "Using spider-web patterns to determine toxicity". NASA Tech Briefs. 19 (4): 82. ^ Thomas J, Chen Q, Howes N (August 1997). "Chromosome doubling of haploids of common wheat with caffeine". Genome. 40 (4): 552–8. doi:10.1139/g97-072. PMID 18464846. Wikimedia Commons has media related to Caffeine. Mayo Clinic staff (3 October 2009). "Caffeine content for coffee, tea, soda and more". Mayo Clinic. Retrieved 8 November 2010.